Is This The Hottest Color Scheme Ever On A 918 Spyder? 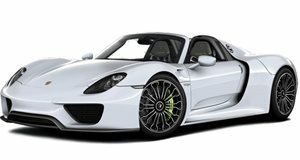 Most Porsche 918 Spyders come in . We think it looks great, but there are hundreds with the same paint color. With such a unique car, why wouldn’t you want a unique color scheme too? Recently in Greenwich, Connecticut, the most unique and creative 918 Spyder showed its colors. It is equipped with the even more wild Weissach package, however it doesn’t show it with the classic Martini or Salzburg Racing coat. Instead, this beauty shines with a custom two-tone red and white paint job that we think looks stunning. This model includes bright red wheels, red mirrors, red accents on air intakes, a red diffuser, red wing and red stripe. The otherwise white body looks stunning and green accents complete the look. The job was done by Detailing Dynamics and took two full months. If we ever owned such an amazing car parting with it for that long would be a real struggle. The owner must be thrilled however. It wasn’t a wrap, so if the project took a turn for a worse the only options would be to repaint it again or drive a silly looking supercar.